Governor LePage says Maine will stop wasting money on services that prolong lives rather than saving lives forever. AUGUSTA, MAINE (The Nil Admirari) - Earlier today, Governor of Maine Paul LePage (R) declared he would be pushing to eliminate all of the state's emergency services after vetoing a bill to increase access to the overdose antidote drug Narcan. LePage claimed police departments, fire departments, and emergency medical services (EMS) were costly, and served only to prolong lives rather than save them forever. "I have fired all law enforcement, fire department, and EMS employees in Maine. Saving someone in Maine from being assaulted, or from a fire, or from a heart attack does not save lives, it just prolongs them," declared Lepage. LePage continued, "And I don't believe it is the government's job to provide life-prolonging services to its citizens, because those services are costly and do not change the fact everyone is going to die at some point." 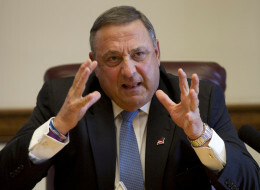 An unidentified member of the press asked Governor LePage if any other costly and unnecessary government programs were on his chopping block due to their limited benefits to society. "I think Maine needs to stop feeding child-sized takers in public schools. Food doesn't save their lives, it simply doesn't make the kids hungry for a little while," replied LePage.